For the first time since 1993, a Philadelphia team is in the US Open Cup final. On Tuesday night, the Philadelphia Union defeated FC Dallas after penalty kicks in the semifinals of the 2014 US Open Cup. Amobi Okugo’s’s 47th minute finish was leveled by Fabian Castillo in the 81st minute, forcing the game to penalty kicks after 30 minutes of goalless extra time. Zac MacMath has been under a harsh spotlight lately. But at the end of 120 minutes and penalty kicks in Dallas, he was center stage for the right reasons. After Maurice Edu drilled his penalty home, leaving the penalty kick tally at 4-3 in favor of the Union, MacMath guessed right and pushed Victor Ulloa’s penalty around his left post. With the save, the Union No. 1, who now has to wait to find out if he will start the Open Cup final, rushed to embrace his delirious teammates. The Philadelphia Union will host the 2014 US Open Cup final at PPL Park on September 16. Jim Curtin restored Amobi Okugo to the lineup and pushed Maurice Edu into the back. Andrew Wenger came in for Danny Cruz on the left. Surprisingly, Sebastien Le Toux had sufficiently recovered from an ankle injury sustained Saturday to start on the right. The match began cautiously, with Dallas looking to work through the dangerous Mauro Diaz and Philadelphia trying to exploit Le Toux’s speed against Michel. Dallas coach Oscar Pareja played Michel at left back, hoping to overload that side with creative players that could release Akindele and play off Perez. The plan did not work. Amobi Okugo was glued to Diaz from the start, and Le Toux was able to run at Michel. 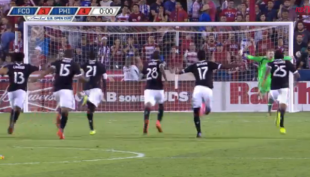 Instead, the way the match would play out was foreshadowed by Fabian Castillo’s first possession on the right. The burner simply rounded Ray Gaddis and spun a cross into the box. Moments later, Akindele stepped in from the right channel to collect a ball 40 yards from goal. Holding off his defender, he turned and tapped a throughball to Blas Perez, who ran in alone on Zac MacMath. The Union goalie was out quickly and as Perez went down, World Cup alumnus Mark Geiger had his first big call to make. He got it right and waved to play on, though he did not issue a caution for the dive. In what has become a hallmark of Jim Curtin’s Union sides, Philly held their defensive shape but struggled to hold the ball. Adam Moffat and Victor Ulloa aggressively chased Vincent Nogueira, forcing the ball wide to Andrew Wenger and Sebastien Le Toux. Both wingers are better playing vertically than creating, and Wenger’s early contributions were ambitious crosses that Matt Hedges and Walter Zimmerman easily dealt with. Nogueira eventually found space behind Moffat and dribbled laterally 25 yards out. His shot was scuffed, but it fell to Le Toux, though the Frenchman was at full speed and failed to control the ball. As the half reached its midway point, the Union tried to isolate Le Toux on Michel. The Dallas left back was getting help from Ulloa and Hedges, but the resulting space went for naught as Conor Casey remained central. After 30 minutes, Dallas pushed Castillo to the left in order to get him away from Gaddis. Almost immediately, the home team began to get the upper hand. Castillo now had a free role, and his run from the left started a move that ended with Michel’s open cross. Perez’s flick found Castillo finishing his run at the back post, but he pulled his shot across goal. Castillo was hardly the only winger firing warning shots. In the final fifteen minutes of the first half, Andrew Wenger emerged as the Union’s best threat with his direct running. Splitting three defenders, he laid the ball off to Casey, but when Fernandez parried the resulting cross there was no follow-up run to finish. Moments later, Okugo’s strong defensive play created a loose ball that Nogueira took forward. He found Casey wide open 20 yards out, but the big man’s shot sailed over the net. Dallas’ central defender Walter Zimmerman was hurt on the play and had to be replaced by JeVaughn Watson. Zach Loyd took over in the middle for the remainder of the half. The last two chances of the half fell to Dallas. First Castillo got past Williams to the endline and cut the ball back, with only Ethan White’s incredible speed burst preventing Perez from taking a pot shot. Then Castillo created havoc in the middle and Perez was able to tap the ball back to Diaz, only to watch the playmaker miss his volley completely. The second half began with more substitutions, as Dallas brought on Stephen Keel for Moffat and Ryan Hollingshead for Diaz. Michel pushed into midfield and Keel partnered with Hedges in the middle of defense. But no personnel changes could stop the Union goal that came next. Nogueira collected the ball in the right channel and pushed it through to Le Toux, who got a step on his man and cut the ball into the box from the endline. Okugo timed his run perfectly and first-timed a shot past Raul Fernandez. It was as sudden as it was beautiful, and the Union were ahead. The warning shots of the first half, however, were about to become much more dangerous. Almost immediately, Akindele found space on the right and played in Castillo, only to see Edu hold him off. Wenger responded with a run of his own, laying the ball off for Le Toux to set up Nogueira for another airball. Not a minute later, Castillo was again in the heart of the Union defense, with Gaddis playing savior this time. Wenger and Watson followed with runs of their own, both coming to naught. Dallas was again behind the Union defense when Akindele found himself racing MacMath to the ball. He won, but MacMath kicked the ball off his feet. It fell to Perez, who tried to lob the defense but only found the endline seating. After 63 minutes, Brian Brown replaced Conor Casey. Though Casey was far from his best, his absence was immediately felt as Brown was not the same physical presence up top. On the other end, Akindele was again pressuring Edu. He created space in the box, turned and fired, but pulled the shot wide. And so the half continued: Wenger would make a driving run, Castillo would answer with his own. The biggest question of the night was whether the speedy Dallas winger would ever beat Zac MacMath to a ball over the top. In the 81st minute, that question was answered. Castillo zipped by the defense and tapped Blas Perez’s throughball around the onrushing MacMath before calmly finishing into an empty net. After the match, MacMath would repeatedly call the play a mistake. Overtime played out in the same vein as the second half. Dallas emptied the midfield and sought to get behind White and Edu while the Union found Nogueira and tried to attack through wide spaces. Danny Cruz entered for Wenger to start the overtime period, and Cristian Maidana made his return from injury soon after. Neither could break the deadlock. Michel and Sheanon Williams matched shots. Akindele and Nogueira did the same. MacMath then parried Perez’s shot and Cristian Maidana coolly finished. Zach Loyd pounded home a fine penalty and Maurice Edu matched him. Edu, wearing the captains armband, then strode over to MacMath and gave him a high five. The Union goalie responded with a glorious save on Victor Ulloa, sending the Union to their first US Open Cup final. The Union will face the winner of Wednesday’s US Open Cup semifinal between Seattle Sounders and Chicago Fire (USsoccer.com, 10:30 pm). On Friday, the Union return to league play to finish their Texas trip in a meeting with Houston Dynamo (9 pm, NBSN, NBC Sports Live Extra). Zac MacMath, Raymon Gaddis, Maurice Edu, Ethan White, Sheanon Williams, Amobi Okugo, Michael Lahoud, Vincent Nogueira, Sebastien Le Toux (Cristian Maidana, 97′), Andrew Wenger (Danny Cruz 90′), Conor Casey (Brian Brown 63′). Author: Adam Cann Adam played soccer for Haverford College and now writes about Philadelphia Union with the kind of tactical analysis rarely seen in the US. He believes soccer bars that don't open for the early game are not soccer bars. Follow him on Twitter @PSPadam. Email him at acann@phillysoccerpage.com. Question: if the key to Dallas becoming more dangerous was to move Castillo away from Gaddis’ tender ministrations, given that Williams and Gaddis have each played left back and right back with approximate interchangeability, why not have Gaddis follow him over to the new side? this is what I was thinking. Just keep screwing with them and move Gaddis around. Even if they switch sides 10 times it will mess with them and their tactics. * were. Now we run CC ragged and sub the striker FO promised us. Kudos to Jim Curtain for realizing he has 3 big games in a week and making lineup rotations rather than sending out all his top players and wearing them into exhaustion. They were just good enough against Montreal and again last night. It probably wouldn’t be a bad idea to rest Noguera against Houston on Friday. After that, the Union have 1 game in 18 days so they should be able to pull out all the stops against San Jose. Squad rotation: it can work for U! So excited for the Final now!! PPL park better be packed. This is history in the making. Little over a month until we hoist that silver. No way we can lose a final at home. Shut up! You’ll jinx it! Do you really want to tempt the wrath of the whatever from high atop the thing? Run outside, spin around three times and spit, or curse. Spit and curse. Go. GO! +2 for the West Wing reference. I was in Lisbon in 2004 when Portugal lost to Greece in the final…please don’t assume home field is a guarantee. Also we all better be hoping for Chicago in the final. Sounders have a team hungry for treble. A fun game to watch. I hope MacMath gets to be the goalie in the final. I agree. He Certainly earned the right to see the tourney through to the end. Why? Hasn’t Blake played as much as MacMath in USOC games this year? Don’t get me wrong. I’d start him too. Just asking. Zac deserves it because his pk saves last night were the reason that we are in the final. Most fitting the season MVP is MOTM with a historic result. I envy the team who gets him and he ought to command solid value back. He has the tools & instincts to be a top GK. If I read it right, he’s as good as there is in league play this year at stopping PKs. With some “Rimando” guy. And I bet his GGA improves with a good, stable backline. Can’t wait for the ratings. Lahoud’s rating should drop a point for every time I caught myself saying ‘F’n Lahoud’ during the match, so somewhere around -10 is about right. And I’m not forgetting about you Ethan White! You too! I told my wife I thought he shouldn’t be allowed past the half way line. Bad passes. Shank shots. Phew. Last night, when Lahoud took a free shot near the top of the box and it damn near hit the corner flag, was the first time I have ever burst into laughter at something one of our players has done. I’ve cursed, slapped myself in the forehead, yelled at the TV, shook my head in disgust and shrugged my shoulders plenty of times, but that shot just made me throw my head back and laugh. I still like Lahoud. I believe he has improved a lot from the last two years, and he definitely has a spot in my gameday 18 and possibly starting XI if we’re shorthanded, but there was something about that shot that was just too funny to hold back. That wasn’t as bad as Saturday when Cruz took a shot from about the same place and it had enough bend to go out for a throw in. Now THAT was funny! Haha! Both shots are in the Complete Disgrace Hall of Fame. The great mistake I made last night was watching Madrid and Seville in Super Cup before that game. Dear God. 2nd half was good, last night. Most entertaining football that we have played, in the Open Cup. On the whole, this tournament has given us some truly terrible matches. Who would have taken PK #5 for the U if needed? Brown? MLS article is quoting Okugo saying he was going to be #5. Apparently, he’s like kryptonite for Dallas. He always scores against them, just like he did earlier in the game. That would have been rubbing salt in the wound if it got to him and he eliminated them. Given the pressure of the situation (had the kick been necessary), I would have chosen Okugo. Other options would have been Brown, Cruz, Gaddis, Lehoud, MacMath, or White. -It’s the oldest soccer tournament in the US. -The Philly area has a rich history with the Cup, including such teams as the Ukrainian Nationals and our own adopted Bethlehem Steel. -Potential entry into CONCACAF Champions Cup. More games to watch the Boys in Blue (or Black). -The extra work load could well give us a chance to see our up and comers soon, to relieve our regulars (anyone want to see Ribeiro and Pfeffer?). -The elevated reputation of the club, both in MLS and internationally – could result in easier recruitment of higher level talent. -Shiny precious metal in a trophy case. -The Beth Steel kit. Even the Dallas announcers like it. BIMBO never looked better. -When you win this tournament, you have, by proxy, beaten everyone – EVERYONE. PS: Mega kudos to Zach MacMath. Impetuous. Homeric. He’s a keeper. I believe it’s the oldest contested soccer trophy in the world. I am often wrong, so don’t take my word as gold. I love the Bethlehem Steel jerseys. And the fact that they wear them in the tourney is cool. I like the tournament. I wish the MLS would use the outlets they have to promote it more. I like the Concacaf birth. There is history etc but keep it in perspective. To win you will have beaten two lower league teams, a disinterested New England, beat a serious Dallas but it took a game of Horse to win and then the last game TBD. Not a big accomplishment but does keep things interesting. For chrissake they need to concentrate on league. I am psyched! Great to see that the team has the ability to grind out wins like this. Was fun watching them play against the Cosmos and last night (although some of the passing was frustrating). Noticed that there were circa 6,000 watching the game on YouTube. Also hope for a sell out on Sept 16!!! Sweet. Vindication for Zak and Amobi. Gutsy win. The Union game on the 16th should be free to assure a packed house. The 6,000 people on the stream was more than Dallas had in the stands. Does the 6,000 include people who watched it on the feed directly through the Dallas website or did you have to access through Youtube? Youtube! That stream was much quicker than the Dallas one (after disabling the comments). The 6,000 was just watching Youtube; I think the number is larger when one includes those watching on the FCD and Union websites. The YouTube feed was good in the second half and the comments during the PKs were so…so OMG cray interwebz FTW. If you were reading them along with me then you know what I mean. There was barely 1000 people there last night. That looked terrible. Yes, that really did happen last night! Still buzzing. Fun game to watch, but got frustrating watching Dallas rush by our back line over and over in the last 15 minutes of regulation and for a great deal of extra time. MacMath might have made a mistake on the goal he gave up, but his aggressive play won the game. If Union win this thing, MacMath should keep it in his own private trophy case. Also, love Connor Casey, but he looks out of gas. yea Pete the last 15 mins. were nerve racking. As for the goal, I really have to blame Williams as he tried to blatantly kill the ball when all he had to do is just get stuck in with a simple tackle to disrupt the opposing player. No need to try to kill the ball into the middle of the field- defending 101 really. I fear that once again Casey will be worked, as my old man used to say, like a rented mule through the stretch. Hopefully he doesn’t get hurt playing tired. The Dallas stream was garbage, but hey, at least it was available. So pumped for a shot at some silverware. Anyone know when the tickets for the final go on sale? The feed itself was awful (way too many shots of fans while the play was going on). However, I thought the announcers did a reasonably good job at being unbiased considering they are paid by Dallas. Yes, they showed more excitement about the Dallas goal than the Union’s, but they also recognized that Philly fans were watching when promoting the ESPN Sunday soccer radio program and at they end they didn’t try to make excuses but said that Philly deserved the win, especially with the play of MacMath. That’s fair enough Andy. What was killing me (besides the choppiness in the first half) was that they cut to replays and fan shots WHILE THE PLAY WAS STILL ON. WTF was that?